In this thesis, methods to improve the accuracy and robustness of terrain aided navigation systems are addressed. First, the functional principles of the three surface-ranging sensor types: altimeters, range-scanning and range-imaging sensors are analyzed. A sophisticated simulation model, covering geometric, beam-shape and signal propagation effects, is developed and validated with recorded real data. To detect and eliminate erroneous altimeter measurements, a validity assessment concept is introduced, as well as a compensation algorithm for erroneous slant range measurements. The compensated height above ground measurement is applied as vertical aiding in an integrated navigation system. The exploitation of the surface's information content is used to enhance conventional matching-based surface navigation systems. A closed-loop compensation method using the slant-range compensation algorithm in surface aided navigation brings further improvements, as well as the extension by a linear drift estimation and a multi-beam sensor setup. 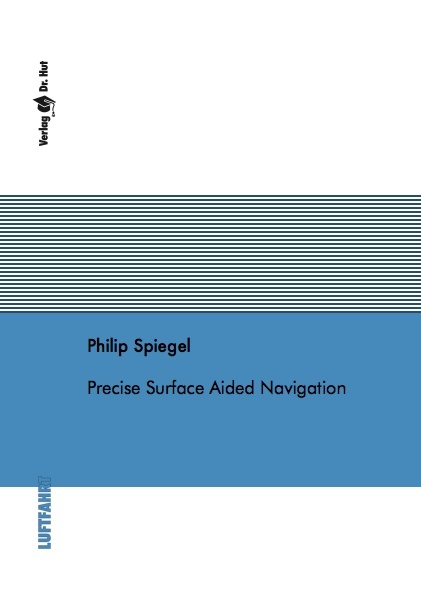 For unknown or fast changing surfaces, a dead-reckoning approach to surface aided navigation using overlapping measurements is introduced to provide a position drift aiding. The flight test instrumentation on the Institute of Flight System Dynamic’s research aircraft including a suite of reference sensors and an in-flight visualization is introduced and explained. The thesis is completed with a simulation study and a real data evaluation of the introduced methods.